Directions to Dixie Cemetery: From Hwy. 98 South of Hattiesburg, turn South onto Elks Lake Road. Go approximately 3-5 miles. Pass first cemetery on right, go to Methodist Church on right. Cemetery is on the corner across from the Methodist Church. 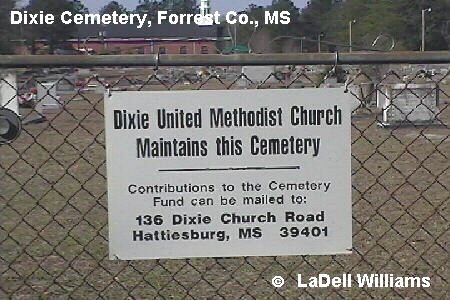 Do you have any headstone photos from this or any other Mississippi cemetery to add to the collection? If so, see How To Contribute. This page is maintained by Rhonda Smith. You are our [an error occurred while processing this directive]visitor -- thanks for stopping by!